We recently wrote about golden spider silk woven into a traditional Malagasy tapestry. 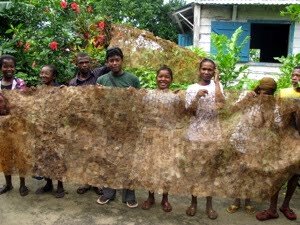 Spider Silk co-author Cay Craig is just back from Madagascar, where she spearheads the Conservation through Poverty Alleviation project, known as CPALI for short. And she's brought lengths of a brand new kind of Malagasy textile made from bronze-colored native silk moth silk. It's impossible not to pun that silk has threaded together various places, projects, and insights over the past 30 years of Cay's life. Cay first knew she wanted to make field research her life's work when she spent time as an undergraduate in Stanford's Human Biology program working with Jane Goodall at Gombe in Tanzania. Working later in Costa Rica, she realized that spiders and their silks would allow her not only to combine field research with her more recent interest in evolution but also to conduct experiments that would be impossible with larger or more mobile animals. And so her career as an arachnologist and eventual authority on silks and silk proteins began. Visiting Gombe in 2002, Cay was devastated by the intervening damage to the forests surrounding the national park. She believed local people often had no option but to rip into the forests surrounding their villages in order to gain cropland or firewood. If there was some way to provide them an economic incentive to plant rather than cut down trees, she figured, they might gain a little more control over their economic situation and revitalize the buffer forest around the park at the same time. That's what CPALI is doing at the edges of the Makira Protected Area in Madagascar – home of the silky sifaka and also site of some of the worst illegal rosewood harvesting. The latest tangible result is a length of bronze-colored, diaphanous textile created by sewing together hundreds of ironed-flat silk moth cocoons. With the light shining through it, this textile is otherworldly and yet earthy, seeming simultaneously mineral and animal. A number of designers are interested in its possible use in wall coverings, lampshades, and window treatments. As sales increase, more farmers can join CPALI and additional forest loss to slash and burn agriculture avoided.